Wrought iron patio sets have a bit of an image problem and are in need of a good makeover. Just like Ikea’s mid 90s “chuck out your chintz” campaign, which railed against floral upholstered furniture. But don’t wait for your local garden centre to ditch their twee wrought iron patio sets. If you’re looking for a timeless statement piece that defines your personal style and complements your landscaping, give some serious thought to a bespoke handmade wrought iron patio set. Don’t just enjoy the view from your window, spend time relaxing in your garden or patio on custom made and comfortable patio furniture. A custom made wrought iron patio set is hammered and forged with passion by artisans. You’re investing in a piece of beautiful, timeless and practical art that will be used daily and last forever. Wrought iron is the material of choice for the harsh climate of South East Queensland. It’s virtually maintenance free and will withstand the baking summer sun, rain and wind. The solid weight of wrought iron means that your patio furniture won’t end up in your neighbour’s back yard, at the bottom of the pool or blown off a balcony during a storm. Cushions can be used to create comfort and allow you to update your patio look each season. Unlike wooden furniture, wrought iron won’t change colour as it ages and is subjected to the weathering effects of sun and rain. With wrought iron, you don’t need to worry about applying a coat of weather protection paint at the start of each summer to protect your investment and prevent it rotting and looking weathered and shabby. Aluminium and steel patio furniture may be cheaper initially but are prone to rust and corrosion. Aluminium also retains heat so is not a good choice if your patio is in the sun, especially if there are kids about. Both are also much lighter than wrought iron and, let’s face it, there is very little ‘wow factor’ in mass produced light weight patio furniture. A bespoke wrought iron patio set bypasses the twee completely. Even if your home is colonial or cottage style, you can create your statement piece without the quaint look that most people associate with wrought iron patio furniture. The strength and durability of wrought iron means that you’re limited only by your imagination, from a solid architectural look to a curvaceous French-inspired look. Traditional, modern or something in-between? The choice is yours. Choose the look that best translates your own unique style into a stunning signature piece that blends seamlessly or stands out from your garden landscaping. Landscape designers love custom made wrought iron patio sets that turn outdoor space into a functional area that complements and showcases your home and garden. Water and weather proof cushions, pillows and throws can be used to bring colour, comfort and seasonal style to your wrought iron furniture. But if you’re after a more streamlined minimalistic look, well designed and made wrought iron furniture is moulded and shaped to be comfortable without cushions. Accent your patio furniture with wrought iron arches, lanterns, sculptures, gazebos, flower pot holders and benches to carry your signature style throughout your garden landscaping. Draw the eye, add interest or just create another spot to sit, smell roses and enjoy a relaxing cup of tea by adding unique seating. There is a world of difference between traditional hand forged and hammered custom wrought iron patio furniture and the cheaply made cast and machined furniture found in most garden stores. Most mass produced patio furniture described as wrought iron is actually made from mild steel, which is prone to corrosion and will often leak rust from joins, staining furniture and floors. Because wrought iron is much stronger than mild steel, furniture made from it can be finer and far more delicate without compromising strength and durability. Cheaply made wrought iron patio sets often have seams and half welded joints, too, which are prone to fatigue and moisture damage. The decorative pieces or finials will also have noticeable seams and a light look and feel to them. When buying wrought iron patio furniture, check for splits, breaks, flaws, seams and rough spots that will be prone to rust and compromise the strength of your furniture and investment. • Washing with warm soapy water and hose clean a few times a year. • Apply a fresh coat of paint every few years. Remove old paint and any rust with a stiff wire brush and sandpaper before painting with a coat of rust inhibiting primer. Sand the primer once dry then apply one or two coats of metal paint. • If you notice any areas of rust between paint jobs, rub the affected area with steel wool or a small piece of sandpaper and coat the area in rust preventing wax. Dean Wilson Iron are award winning iron artists with over 20 years’ experience in creating wrought iron masterpieces. They can help you bring to life your very own contemporary work of art with customised wrought iron patio furniture. Their team of in-house designers and craftsmen will help you design patio furniture that is far more than just functional. Create a piece of art that will grace your patio of years to come. Get the exact look you want, from bold, quirky and rustic through to curvaceous with elaborate scrollwork, traditional Colonial to modern minimalism. A bespoke wrought iron patio set is a timeless investment that will never let you down. To talk to an iron artisan about a custom made wrought iron patio set, contact Dean Wilson Iron online or call them on 07 3814 0076. 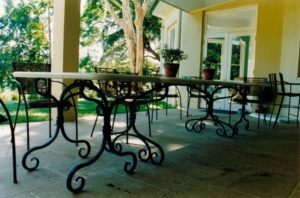 Previous Post Wrought Iron Custom Furniture in Brisbane Homes and Businesses – the Finishing Touch You NeedNext Post Designer Balustrades: What Material is Best?